Delighting in the Lord through the journey of life as His unique daughter. A couple of weekends ago I participated in the Faith Runs Deep 5K at my church, Community Bible. I walked/ran the 5K in the event’s inaugural year, it was the first time I had ever completed something of that magnitude. (Yes, I know magnitude may sound like a strong word, but for me it was a BIG deal. Exercise and me have not always been the dearest of friends.) Last year, I didn’t register and found myself a little sad on the day of the event wishing I had participated again. So, as soon as registration opened this year, I was all over it. 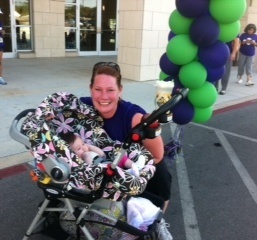 I registered for the 1 mile stroller dash, and was ready to give Savannah a fun walk/run in her cute carriage. Now, something to keep in mind… I have been virtually exercise-free for the past year. Between being pregnant and adjusting to new mommy-hood, the number of times I exercised can be counted across my fingers and toes. I had great intentions and did really well for about four weeks between June and July. I walked a few times a week at our local park, and really enjoyed it. But as soon as the 100° temps started arriving by noon, I was done. I reasoned that I would walk in the evenings after the sun went down, but there was always something deterring me (like the television, laundry – really great excuses, uhm not-so-much, but any excuse will do, right?). So, the Saturday of the big event arrived. Savannah and I woke at 7 am, got ready for our day and trekked off to CBC ready to knock out our 1 mile. Even without training, I reasoned that I should be able to finish 1 mile in about 20 minutes, right? We saw some familiar faces, did a little Zumba to warm up and took off for our first lap with the rest of the strollers, walkers, and cutie patootie little guys on tricycles. And around we went, as we crossed the starting line, finishing our first lap and 1 mile, I looked at the clock – it was just under 20 minutes. Whoo hoo! Then I realized, I’m not tired at all, I can do another mile. So we did! The sun started to shine a little brighter, and my body worked as a good sunshade for my sweet girl who enjoyed napping and looking at the people passing by. We completed our second lap and it was 41 minutes. As I looked at the clock, I immediately thought – “I can finish this in 1 hour, I just need to shave 1 minute off this lap.” And around we went for our third and final lap. It’s so funny that it didn’t even occur to me to stop after two miles, I immediately jumped to finishing the 5K. Half way through the final lap, the sun began to deliver its full force on my un-sunned skin. I knew I could finish, but the goal of finishing in an hour seemed to fade away and simply finishing was moving into focus. Just when I was about to slow to a leisurely stroll, a sweet girl, a member of the Mac ROTC crew, started cheering me on. Then she asked if she could push the stroller for me for a little while, which sounded like a wonderful gift. As I passed the handle to her, she started to jog, and next thing I knew, I was jogging right along side her. As the jog started to get harder, yet another sweet ROTC girl came along side me on the other side to jog with us. I felt as if I was pulling their teenage strength, it was crazy. As we approached the final stretch, they encouraged me to move to a faster jog. I was certain I had the pedal to the metal and fought them. Then as we rounded the corner and I could see the time clock, I saw that it was at 59 minutes and change, so close! Without even thinking, I took off in a run, nearly a sprint. You would have thought I was finishing the Rock and Roll Marathon as I crossed that finish line, as I passed under that green and purple balloon archway I looked up to see 1:00:00 on the clock. We did it!! I finished the 5K in 1 hour and Savannah finished her first 5K. Whoo hoo! The two ROTC girls were parakletes to me – they came alongside me. There was no way I would have attained my 1 hour goal had they not stepped up, literally alongside me, and set a new pace. There is such power in supportive people. Even when we think we can’t go on, He brings people beside us to set a new pace to reach the goals He has for us. We are called to run the race of the Christian life with perseverance and endurance, even as the hot sun beat on me I knew I needed to finish what I started. Made me think of Hebrews 12:1, we are called to run the race of our faith with perseverance. I was inspired to do this event and was faithful to complete it – and even better and bigger than I had planned. Which brought Phillipians 1:6 to my mind – He is faithful to complete His good work in us!! Thank you for bringing the right people along side me exactly when I need them! I commit to run the race with endurance, leaning on you to provide me the strength I need for the journey. You are so faithful to complete the good work in us, and I pray that You will shine through me! Just an ordinary gal with an extraordinary God!